This back to basics article will focus on Salt even though it is categorized as a mineral (not as a spice or dried herb). While most people use Salt to enhance the flavor of recipe or use it as a food preservative, Salt actually plays the role of being the flavor coordinator (ensuring that flavors meld and do not overpower one another). While, I am not a huge fan of Salt and like to cook with it sparingly, I did learn a lot about Salt while working on this article. Most importantly, one learning is the fact that our bodies need salt. Salt has sodium which maintains fluid in blood cells (affecting nerves and muscles). Low sodium in our bodies will typically happen when one is dehydrated. Symptoms of low sodium are muscular weakness, cramps and heat exhaustion. This can be avoided by eating a balanced diet. The most popular type of Salt used for cooking is Kosher Salt which is known to dissolve quickly. It is coarse in texture…making it easier to grab with your fingers when cooking. It is harvested from either the sea or the earth. Another type of Salt that is popular for cooking is Sea Salt. There are many different categories of Sea Salt. 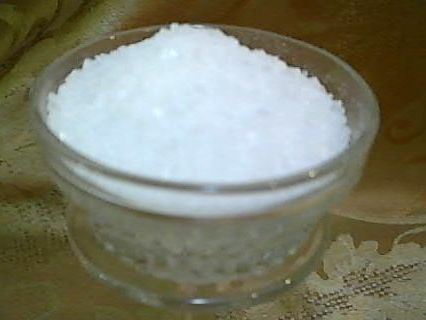 Crystalline Sea Salt is added to food at the end of the cooking process. It has a tangy flavor that complements all foods. The texture can be either fine or coarse. Sea Salt may contain minerals that impact the color of the Sea Salt crystals. These additional minerals may also impact the flavor of the Sea Salt. Flaked Sea Salt is also added to food at the end of the cooking process. It has a briny flavor which pairs well with vegetables and shellfish. 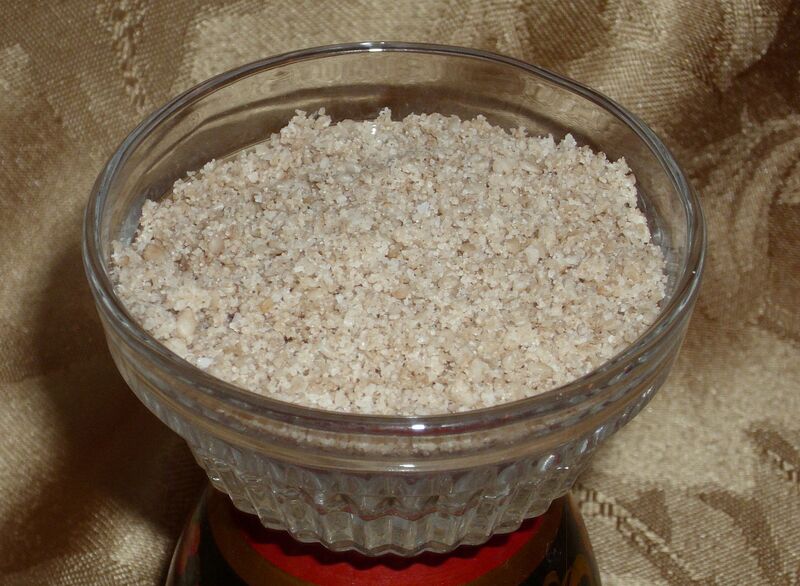 It is soft in texture and has “pyramid-like” shaped flakes. Of all the Salt types, it dissolves the fastest. It is typically harvested in England. Fleur de Sel is used at the table so it can be dusted on food just prior to eating. It is known as a “special occasion” salt that is earthy in flavor and dissolves slow The texture is described as being crystalline. It is harvested by hand in France. Pickling Salt is used to brine food. It is very concentrated in flavor in comparison to Kosher Salt. Be sure to adjust the amount of salt in your recipe where needed. It is just about 100% sodium chloride and is not fortified with iodine (like table salt is). It’s texture is fine-grained like table salt and can be harvested from the sea or the earth. Transfer ingredients to a spice grinder and grind until you have a sand-like consistency. Note: Can be refrigerated for up to a month. Taster’s Comments: Used it on Grilled Steak. It was awesome! Remove from heat. Stir in almonds and vanilla extract. Spread chocolate mixture into the prepared pan. Sprinkle with the Sea Salt. 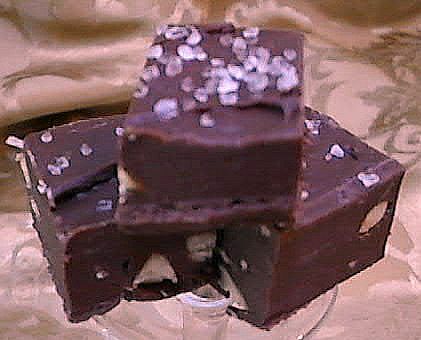 Lift fudge out of pan and peel off the aluminium foil. Cut into 36 squares. Blogger’s Comment: Try substituting smoked almonds for plain almonds. It goes really well with the Sea Salt. Taster’s Comment: Candy quickly disappeared. They liked the salty sweet combination. Add a dash of salt to green salads to prevent wilting. Add a pinch of salt to beat egg whites — it will make them fluffier. Add a pinch of salt to whipping cream and they will whip up faster. If you use too much salt in a soup or stew, simply add a raw potato. Soak clean hands in salt water after cutting hot chili peppers to prevent chili oil from getting in your eyes. Soak fish or seafood in cold, icy salt water for 15 minutes. When done, dry and prepare. (Rule of Thumb: 1 tablespoon salt to 2 quarts of cold water). Gargle with hot salted water when you have a sore throat. Mix with baking soda to brush your teeth. Add a little salt to your water for your vase. The cut flowers will have a longer life. If you have a wine-stain, cover with salt, rinse in cool water. Use salt to kill weeds in the lawn or to kill grass between sidewalk bricks.